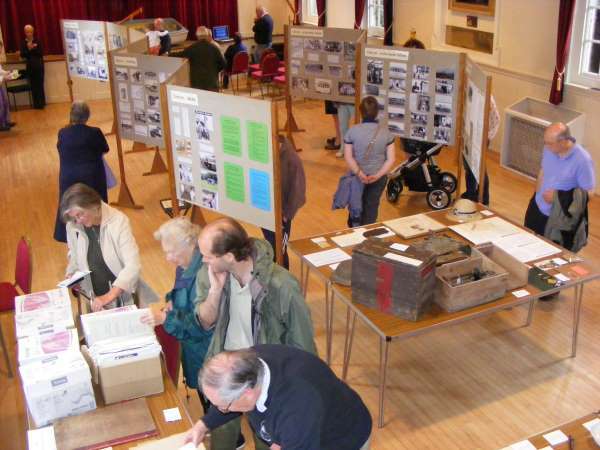 The Wargrave Local History Society held its AGM at the March meeting, when the past year was reviewed, a new committee elected, and details of the 2019-20 programme given. Following the formal part of the evening, Society Secretary Peter Delaney gave an illustrated presentation on the history of the Wargrave Village Festival. Wargrave as a community has long held events for villagers to enjoy and take part in. 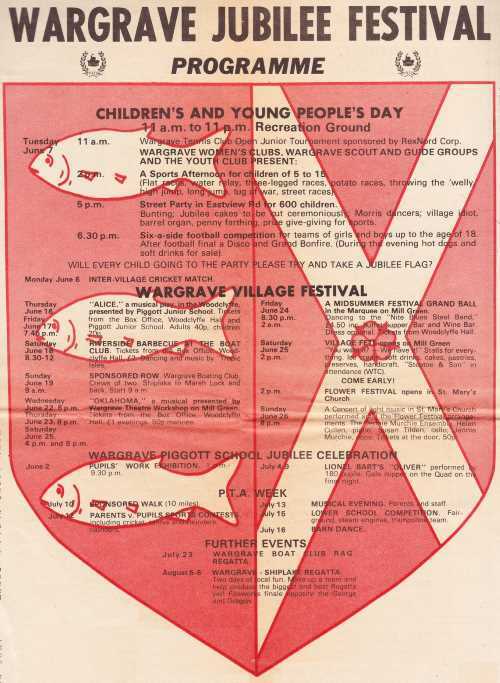 but it was the then vicar, John Ratings who had the idea of a Wargrave Village Festival, with a proposal in the January 1974 Parish Magazine. A meeting was called "to explore the possibility of a Village Festival for 1975 centred on the Church and the Mill Green. It will be a useful exercise to do something for village unity in the days when our country desperately needs a common aim and purpose". His idea was to "unite the community and have fun together" - whether from 'the big houses' or Highfield Park, or anywhere in between, all would be encouraged to take part - although many villagers "thought he was crazy - that it would not work,"
At about the same time the Wargrave Theatre Workshop was being formed, and it was arranged that their presentation of "Oliver!" be part of the Festival with a Flower Festival on the Saturday and Sunday, 'Stalls on the Green' on Saturday afternoon, followed by the Ball in the evening, and a Concert in the Church on the Sunday evening. The subsequent issues of the magazine reviewed of the Festival - even the weather had 'picked up' for those few days in early June, and the event showed a moderate profit, shared between the Theatre Workshop, the Scouts, the Flower Arrangers, the Guides, the Woodclyffe Hall, Woodclyffe Hostel, Crazies Hill Hall, Hare Hatch Hall, and the Church. By July 1976 it was "planned that there should be a Village Festival in June 1977, to mark the Queen's Silver Jubilee". 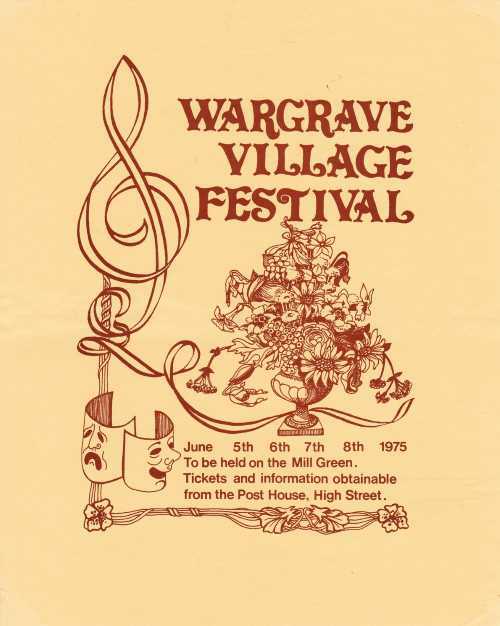 A special 'newspaper' was sold in the village - the Wargrave Times, which included the Festival programme and carried a message from the Queen that she hoped it would be a 'great success'. The range of events was greater, the event lasting over two weeks. It was also judged a financial success, and by October that year, the question was being asked "When is the next Festival?" It was set to become a regular bi-annual event. In 1979, new ideas included a 'best dressed shop window' competition, a horse show and gymkhana and a "Miss Wargrave" competition - although that year there was a disappointing response to the latter whilst the veteran actor Robert Morley headed the parade in a horse-drawn carriage, to then open the Festival Fete. The basic 'pattern' was now set for future Festivals - a Wargrave Theatre Workshop production over several evenings, a flower festival, concerts, sporting activities, an event for the 'teenagers', a 'Grand Ball' on the Friday of its last weekend, with a village fete on the following Saturday afternoon. The "Festival Queen" event was run again in 1981, with much more success, being won by Lizzie French who rode in the parade with Robert Morley. A 'different' type of event in 1983 was lawn mower racing - for ladies as well as gentlemen, and there was another gymkhana, whilst the Festival Parade was again led by Robert Morley, and various local well known personalities have been involved at various times - Paul Daniels also opened the fete, Mary Hopkin judged a 'knobbly knees' contest, and Sandra Dickinson and Peter Davison - then performing the part of veterinary surgeon Tristram Farnon in BBC tv's 'All Creatures Great and Small' - was one of the judges at a pet show. In more recent times, each Village Festival has had a 'theme', reflected in the programme design, and many of the events are 'adapted' to suit. The Wargrave Local History Society has not only recorded the Village Festival, but has been actively involved with it. Past events have included displays of historic photographs, historic village walks, and antiques valuations etc. For 2019, the theme is "That's Magic! ", and the Society is - of course - taking part. As John Ratings said some years ago, the Festival has gone on from strength to strength, and continues to bring all parts of the village together. The evening concluded with some film of the 1981 village festival - the audience recognising many 'familiar faces' from 38 years ago! The next meeting will be on Tuesday, April 9th, when members will visit the Leander Club for a tour and to hear of its 200 year history. Then on Tuesday May 14th, the subject will be Wargrave Churchyard Excavations, when the archaeologists who carried out the exploration in early 2018 will talk about what they found, and what that shows about Wargrave and its inhabitants in centuries past.